Well that was a depressing end to the season. Another goalless effort from Saints. That's five games in a row. Just 17 goals in 19 games. Worse than that, was the way the crowd took it. As usual there was supposed to be a 'lap of appreciation' by the players and staff after the match, unfortunately about two thirds of the crowd left at the final whistle, if not before. All a bit embarrassing. Saints had a lot of possession in the first half, without really troubling Butland in the Stoke goal. Although it struck me that this didn't look like a team that was doing anything other than busting a gut to score. All the rumours about the manager had lost the dressing room seemed just that - rumours. Austin was up front instead of Gabbiadini, after his long recovery from shoulder injury and he was making a big difference to the team, if only the way he was constantly badgering the players to do things differently/faster/better. That in itself was good to watch. Stoke were not getting much joy, with the usual solid performance from Saints defence. The two centre backs in particular caught the eye. Yoshida was in a particularly determined mood and Stephens was his usual excellent self. The young Englishman has been one of the great unexpected successes of the season. For Stoke, that nasty little Shaqiri caught the eye, he was forever complaining to the ref about some imagined wrong and falling all over the place. A real 'Napoleon Complex' if ever there was one. He should have a decent career with the Royal Shakespeare Company when his football comes to an end. Just before half-time came the moment when Saints almost broke their scoring drought. Redmond chased down a backpass and pressured Butland into dithering. The end result was that Redmond came away with the ball and tried to lob the keeper from way out. Time seemed to slow as Butland frantically back-pedalled. The ball was clearly going to drop behind the goalie, but agonisingly clipped the crossbar and went over. 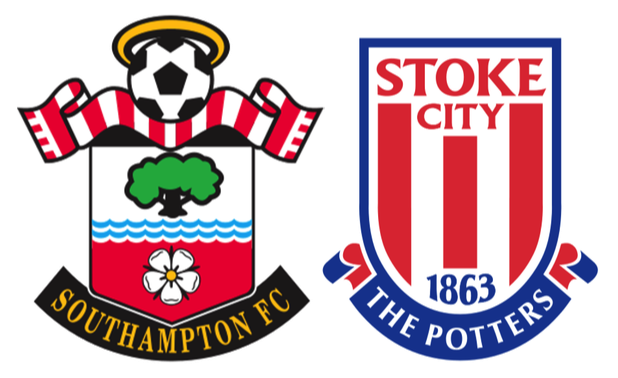 That would have been a brilliant goal . . . .
Half-time and it was 0-0, Saints on top, but we still can't score. The build up was laboured and all that seemed to achieve, was that Stoke had plenty of time to get organised. Time after time. Not a pretty watch. The second half set off in the same way that the first had ended. Saints with the possession. The moment that I felt was only one small mistake away eventually happened. A corner was taken on the right and the ball dropped just by the far post and who should be standing there (he might have been jumping), but Peter Crouch. Goal. He might look like a lamppost, but he is a decent footballer. Needless to say, the Stoke fans went mental. Puel reacted by replacing Charlie Austin with Gabbiadini and Tadić with Boufal. Like for like. There was some booing at this point followed by calls of "You don't know what you're doing". It was obvious that this wasn't aimed at the players, but it couldn't have helped their state of mind. These changes were never going to change the course of the match. The game continued, with agonising misses arriving at regular intervals. I remember someone saying after one miss, "What exactly have we f**king got to do to put the ball in the net?". One that sticks in the mind was a one on one with Gabbiadini against Butland, after a great through ball from Boufal. A wonderful piece of goalkeeping forced the Italian out wide and the moment was gone. Gabbiadini wasn't the only one to suffer at the hands of Butland, he also made great saves from Steven Davis, Boufal and JWP. On another day Saints could easily have had five. Time eventually ran out, to a few half-hearted boos and thousands walking out on the 'lap of appreciation'. And that was the end of Saints 2016-17 season. The Premier League fixture list for 2017-18 will be out on June 14th. For his sheer cussedness and refusal to give up, coupled with him trying to be a centre-forward reminded me of the much missed Virgil van Dijk - it has to be Maya Yoshida.